It's a cold morning in Oslo on the first day of Oslo Runway. On the subway youth culture icon, Elise By Olsen, is changing from warm clothes into high heels and a floppy, striped cowboy-ish hat. "I think Norway has the most progressive and interesting fashion scene in Scandinavia right now. I'm very excited," she tells me. We're on our way to the Munch Museum, where the designer behind By Olsen’s hat, Anne Karine Thorbjørnsen—winner of last years Bik Bok Newcomer Award—is about to open the ball. The mood is somewhat lighter this season, more relaxed, less concerned with how everything is going to turn out. Janka Polliani, fashion blogger and international street style favourite, has been around the fashion week block. "It feels very international. At the same time we're still missing some real fashion critique. I think people are afraid to be too negative. Nobody wants to lose Oslo Runway," Janka says. Still, a question that circulates is whether it would be more convenient for the fashion pack to have one big Scandinavian fashion week? Founder of Tableau Paper, Tove Sivertsen, disagrees. "We can’t build an industry without a culture, and Oslo Runway helps create that culture," she says. Fashion journalist and consultant Ida Eritsland agrees. "Not even a fraction of these people would turn up in Stockholm, for instance. What I think we need to do, however, is to engage and excite the whole of Norway, not just preach to the choir. Norway is the biggest market for both H&M and Acne. We have to be our own best clients, to create a bigger and better market for Norwegian design, at home." As the shows progress, there seem to be a lot of beige coats around, though some stand out. C.L.E.A.N by Christina Ledang, with her fresh pastels and square-cut faux fur, was fun—very Claudia Chiffer in Versace A/W94. 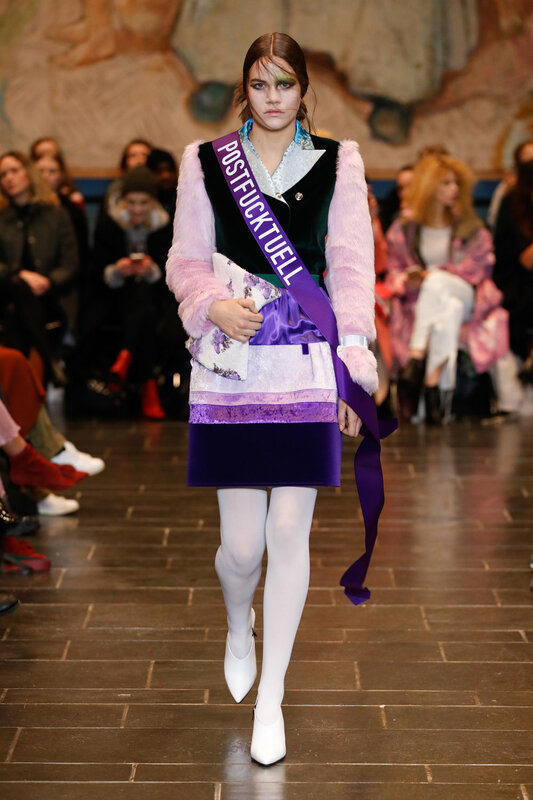 Admir Batlak showed a similar color palette, with fuzzy pink and purple dresses adorned with clown collars and mock-political pageant sashes. Anne Karine Thorbjørnsen’s draped dresses and deconstructed shirts have been a massive hit with the fashion crowd in Oslo, and her new collection brought her distinct style to a new level. This time with elements of reptile and a more potent color palette. Steel blue. Pale purple. Hints of red. On the more commercial side of the scale, Holzweiler and By TiMo cemented their status as solid providers of respectively streetwear with a hint of artistic spirit and romantic dresses. Yet, the Munch-references at Holzweiler (famous paintings like Scream and The Sun copy pasted onto sweatshirts) were a little blatant, and the flowy, flowery vibe at ByTiMo is starting to get a bit old. Oslo Runway has undoubtedly evolved into a decent version of what fashion weeks are supposed to be, traditionally. But there is still something missing, according to PR consultant Jostein Wålengen. "Fashion week as a phenomenon is close to becoming outdated. Buyers don't go to shows anymore. So for the people in the audience, the relevance revolves around the show itself, in a 48-hour bubble. There is no increase in sales for the designers showing at Oslo Runway. Many of them would do better in terms of sales by going to fairs instead. This format is about to loose its relevance," Jostein says. Instead, he believes in the evolving digital media. "Until now, most digital platforms have been shaped by print media, which is surreal," Jostein adds. "There are so many unexplored possibilities. Take what is happening to style.com as an example. Hosting shows digitally, like Vogue did with Burberry, might be a better solution." Fashion weeks are a bit like monarchy: there are probably better and more modern ways to do this, but we keep it anyway. Because we always have. And perhaps because we enjoy the glamour of it. But instead of royalty, we eagerly observe a hierarchy of influencers and the occasional SKAM actor. I can't help but wonder if this arena actually works for the better of the fashion industry, or if we are clinging on to an old fashioned tradition for our own sake. After all, Oslo is never as beautiful and full of style as during Oslo Runway. Photography from the top: Anne Karine Thorbjørnsen, Holzweiler and Admir Batlak.